Mississippi's registered voters will not be required to present identification in order to vote in November-- just don't expect to hear that from Secretary of State Delbert Hosemann or any of his fellow Republicans. 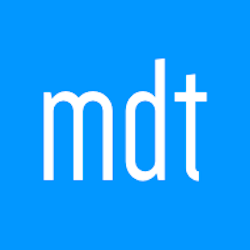 Mississippi's voter ID plan is currently under review by the Department of Justice, a process likely to extend beyond November 6. But instead of carrying out his constitutional duties and clarifying the current state of voter laws in advance of election day, our Secretary of State is doing all he can to muddy the water. 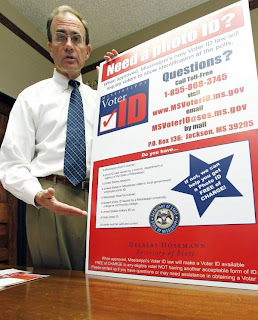 This month, Hosemann has spent considerable time telling any coffee klatch who will listen that Mississippi has passed a voter ID law, that the the new law will require voters to present identification before voting, and that the Department of Justice is a bunch of meanies. He also pauses for the occasional photo op. Careful observers will note that Hosemann has been on a Katherine Harris-like trajectory for years now and it's unlikely his office will engage in any honest to goodness voter education projects between now and November 6. It's hard to say what confusion lies in store over the next several weeks. Keep an eye out for foolishness and remember: Mississippi's registered voters will not be required to present identification in order to vote in November.